It’s good that more people are drinking bottled water these days, but what isn’t good is that there are many plastic bottles that often do not get recycled. Even the plastic bottles that get recycled are not 100% renewable. Fortunately, Brandimage has created the 360 Bottle. I’m assuming it is called the 360 because it is 100 percent recyclable. How is that possible? Because the Brandimage 360 is made of paper. Granted, the 360 Bottle doesn’t have the clear aesthetic of most water bottles, but I think we all need to sacrifice a lot of plastic to Save the Earth. It certainly is an idea whose time has come, and it has already received an IDEA (International Design Excellence Award) for this concept. 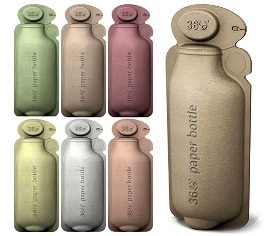 By the way, you can use these paper bottles for more than just water. So are we looking at an age where all our liquids: water, soda, and Frappuccino are only available via paper bottles? If we really are desperate about the environment, then the answer is “heck, yeah”. All right, this leaves only one question. How does a 100% paper bottle make the water or other liquids taste? It’s like those water bottles for your bike that always make your water taste like plastic. Hopefully these paper bottles won’t have the same effect. Why is it good that more people are drinking bottled water? Any idea HOW they process the paper to be water-proof? I mean… its porous, fibrous and absorbent. Does not sound like normal paper. Coated with some carcinogen likely. Can’t be wax coated like a cup because coated papers aren’t recyclable.